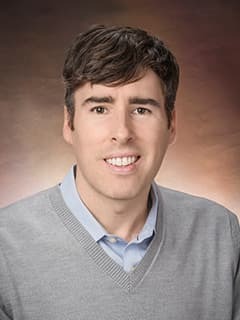 Christopher M. Janson, MD, is an attending electrophysiologist in the Cardiac Center at Children's Hospital of Philadelphia. Nguyen MB, Ceresnak SR, Janson CM, Fishberger SB, Love BA, Blaufox AD, Motonaga KS, Dubin AM, Nappo L, and RH Pass. “A Multicenter Review of Ablation in the Aortic Cusps in Young People.” Pacing and Clinical Electrophysiology, 2017; 40(7): 798-802. Ceresnak SR, Nappo L, Janson CM, and RH Pass. “Tricking CARTO: Cryoablation of Supraventricular Tachycardia in Children with Minimal Radiation Exposure Using the CARTO3 System.” Pacing and Clinical Electrophysiology, 2016; 39(1): 36-41. Janson CM, Ceresnak SR, Chung WK, and RH Pass. “Catecholaminergic Polymorphic Ventricular Tachycardia in a Child with Brugada Pattern on ECG: One Patient with Two Diseases?” Heart Rhythm, 2014; 11(11): 2101-2104. Janson CM, Poelzing S, and MJ Shah. “Combined Inhibition of Na+ and Ca2+ Channels: A Novel Paradigm for Treatment of Incessant Ventricular Arrhythmias in Andersen-Tawil Syndrome.” Heart Rhythm, 2014; 11(2):318-320. Janson CM, Patel A, Bonney W, Smoots K, and MJ Shah. “Implantable Cardioverter-Defibrillator Lead Failure in Children and Young Adults: A Matter of Lead Diameter or Lead Design?” Journal of the American College of Cardiology, 2014; 63(2):133-140. Janson, CM et al. “Predictors of Marriage and Divorce in Adult Survivors of Childhood Cancers: A Report from the Childhood Cancer Survivor Study.” Cancer Epidemiology, Biomarkers, and Prevention, 2009; 18(10): 2626-35. Janson CM, Ceresnak SR, Dubin AM, Motonaga KS, Mann GE, Kahana M, Fitz-James I, Wise-Faberowski L, Kamra K, Nappo L, Trela A, Choi JM, and RH Pass. “A Prospective Assessment of Optimal Mechanical Ventilation Parameters for Pediatric Catheter Ablation.” Abstract Rapid Fire Oral at American Heart Association Scientific Sessions, November 2016. Escudero CA*, Ceresnak SR*, Collins KK, Pass RH, Aziz PF, Blaufox AD, Cabrera M, Cannon BC, Cohen M, Dechert BE, Dubin AM, Motonaga KS, Epstein MR, Erickson C, Fishberger SB, Gates GJ, Capone CA, Nappo L, Kertesz NJ, Kim JJ, Valdes SO, Kubuš P, Law IH, Lampe J, Moore JP, Perry JC, Sanatani S, Seslar SP, Shetty I, Skinner JR, Marcondes L, Stephenson EA, Asakai H, Tanel RE, Uzun O, Zimmerman FJ, Etheridge SP* and CM Janson. * “Intermittent Pre-excitation in Wolff-Parkinson-White Syndrome in Children Does Not Guarantee Low Risk Accessory Pathways or Low Risk of Life-Threatening Events.” Oral Abstract at Heart Rhythm Society Scientific Sessions, May 2017. Ceresnak SR, Pass RH, Dubin AM, Kim JJ, Valdes SO, Fishberger SM, Shetty I, Zimmerman F, Tanel RE, Epstein MR, Motonaga KS, Avasarala K, Capone CA, Nappo L, Gates GJ, and CM Janson. “Intermittent Pre-excitation ≠ “Low Risk”: Prevalence of “high risk” accessory pathways in children with intermittent pre-excitation undergoing EP study.” Poster at Heart Rhythm Society Scientific Sessions, May 2016. Pass RH, Liberman L, Silver ES, Janson CM, Blaufox AD, Nappo, L, and SR Ceresnak. “The "Hidden" Left Sided Accessory Pathway: An Uncommon Cause of SVT in Young People.” Poster at Heart Rhythm Society Scientific Sessions, May 2016. Ceresnak SR, Pass RH, Dubin AM, Motonaga KS, Avasarala K, Trela A, McElhinney DB, Hedlin H, Yang L, Janson CM, Nappo L, and GJ Gates. “Ablation Made Ridiculously Simple: Validation of a novel automated signal analysis tool for the ablation of WPW in children.” Poster at Heart Rhythm Society Scientific Sessions, May 2016. Nguyen MB, Ceresnak SR, Janson CM, Fishberger SB, Love BA, Blaufox AD, Motonaga KS, Dubin AM, Nappo L, and RH Pass. “On the Cusp of Something New: A Multicenter Review of Ablation in the Aortic Cusps in Young People.” Poster at Heart Rhythm Society Scientific Sessions, May 2015. Patel AR, Rossano JD, Kantor PF, Towbin JA, Colan SD, Everitt MD, Jefferies JK, Dodd DA, Silva JN, Janson CM, Wilkinson JD, LaRocca TJ, and SE Lipshultz. “Eligibility for Cardiac Resynchronization Therapy for Systolic Heart Failure in Children with Cardiomyopathy.” Poster at ISHLT Annual Meeting and Scientific Sessions, April 2015. Janson CM. Poster Moderator/Discussant, “Pediatric and Congenital Electrophysiology Outcomes," American College of Cardiology Scientific Sessions, April 2016. Janson CM. “Contemporary Management of Supraventricular Tachycardia in the Pediatric Population”, Department of Pediatrics Grand Rounds, Jacobi Medical Center, Bronx, NY, November 29, 2016.